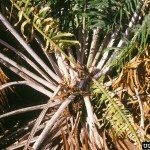 I have a male bloom on my Sago palm, but it has sprouts coming out of it, is this normal? Can you include a photo? This is quite odd. I will be more than glad to help, but I will have to see what is going on.